What is a gas safety check or landlord certificate ? A gas safety check involves a Gas Safe registered engineer inspecting your gas appliances. 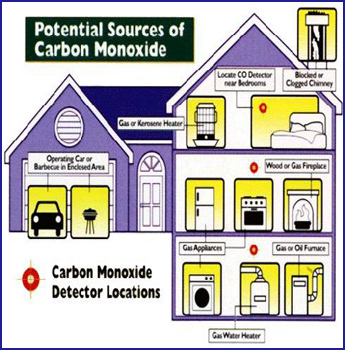 Carbon Monoxide Safety Facts !! Carbon Monoxide can kill !! Carbon monoxide (CO) is a colourless, odourless, tasteless, poisonous gas produced by gas appliances which have not been properly installed or maintained. You can’t see it. You can’t taste it. You can’t even smell it. But carbon monoxide can kill without warning in just a matter of hours. You are particularly at risk when you are asleep because you cannot recognise the early symptoms of carbon monoxide poisoning. These include tiredness, drowsiness, headache, nausea, pains in the chest and stomach pains. These syptoms can mimic many common ailments and may easily be confused with flu or simple tiredness. Some of the reasons you may be at risk of carbon monoxide poisoning : your appliance was poorly installed your appliance is not working properly your appliance has not been checked for safety or maintained regularly; there is not enough fresh air in the room your chimney or flue gets blocked up you allow an engineer who is not on the Gas Safe Register to install or maintain your appliance(s).